All boats on the Chain O’ Lakes must display a Fox Waterway Agency sticker. Its use is required by law and with your purchase you contribute to maintaining the lakes and rivers of the Fox Waterway for your enjoyment and our waterways conservation and sustainability for years to come. The Fox Waterway Agency sticker color changes each year. It is valid each year from January 1st – December 31st. Included on the sticker is a bar-coded number, expiration date and letter in the middle indicating which type of sticker it is. 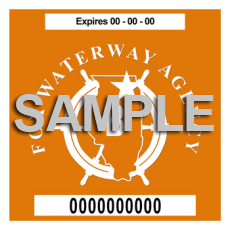 Besides the Fox Waterway Agency sticker, all boats must display a current state registration sticker (EX: Illinois Department of Natural Resources sticker). It can be purchased or renewed through their website www.dnr.illinois.gov or by calling 1-866-867-3542. Come to the Fox Waterway Agency office or to one of our satellite locations throughout Lake and McHenry county. Renew your sticker online, by mail, at the Fox Waterway Agency office or at one of our satellite locations.